Elegant, Asymmetrical Styling And Integrated Lighting Create A Unique Visual Display. Stuff Points: Earn 52 points when you buy this stuff. 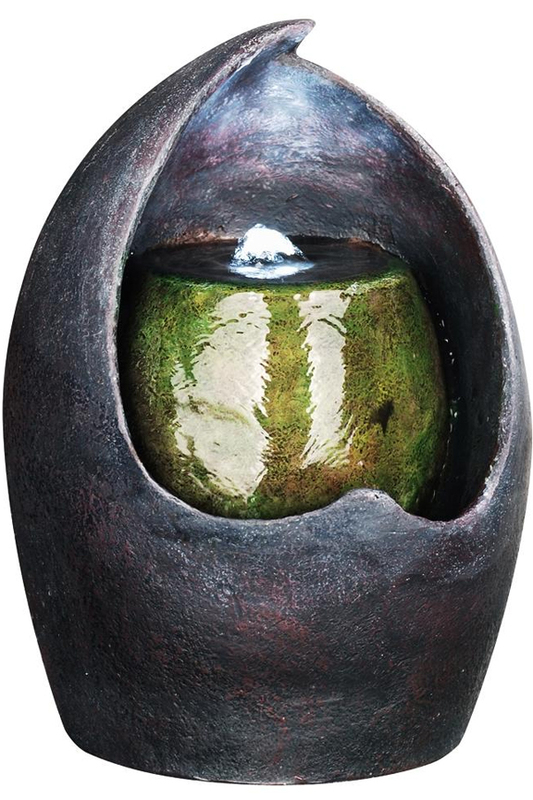 A simple, urn-style fountain has been given a modern twist to create a bolder, more intense look. The asymmetrical styling is interesting by itself, but the vibrant coloring really makes it stand out. Cool blues and purples wrap around the inner shape that is mostly greens and browns. The sharp and deliberate shape on the outside of the fountain frames the action in the middle, and a bright LED light adds to the effect. Once turned on, water will pump up the center, and then begin bubbling out of the top. From there, it will cascade down on all sides to fill the lower basin, and then cycle back up to complete the whole journey over again. The underwater light will add to the effect, and because it shines straight up, the interior of the structure will illuminate, and appear to change colors. It looks like it was made from a natural material, but it's actually molded from a lightweight and durable resin that gives an authentic look at a price you can afford. Add an elegant touch to your backyard patio, or provide the perfect focal point to your living room, office or bedroom. It comes complete with everything necessary for operation, and the electronics are backed by a one year warranty from the manufacturer. At ten inches tall, it is perfect for any table, shelf or desk top location. Simple Set-Up. Includes all parts, and comes mostly assembled, with easy to follow instructions. LED Light. A bright bulb shines up at the center to improve the look. Water will sparkle, and the colorful urn will take on a different look. Colorful. Greens, purples and other shades blend together for a unique look. Unlike the natural coloring found on other models, this vibrant finish will give that pop you are looking for. High Quality. High quality materials ensure a sturdy build, and long lasting durability. Top quality electronics guarantee proper performance. Indoors or Outdoors. The material is durable, so place on any table, inside or out. Subtle Sounds. No waterfalls or pouring spouts, this model features a gentle cascade over the full surface of the inner shape. The gentle trickle is certainly noticeable, but less intense than others. This model is 10 inches tall, and 8 inches wide on it's longest side. Colorful materials, integrated lighting and a unique shape make this fountain perfect for any space. Add visual appeal and relaxing sounds to any location. Order Yours Today!